A couple of hiking trips ago, we came across a familiar sight. 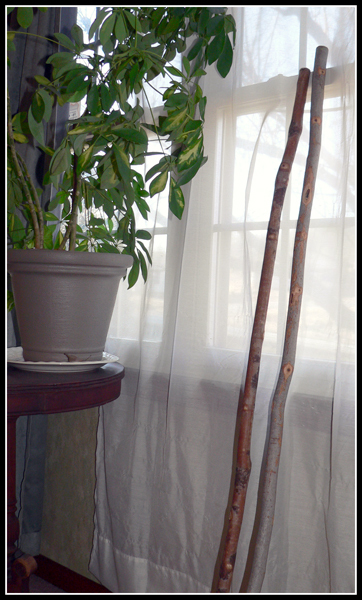 I cannot tell you how many times I've seen those handcrafted walking sticks forgotten in a parking lot. If we weren't as honest as we are, we could probably make some extra dough selling those babies! Usually we either leave them where they are, or turn them in to the park office. The office was closed the day we happened upon that stick. After commenting on how someone was going to kick themselves when they realized it was missing, we headed on towards the trail. But it was here that the larger mystery began. 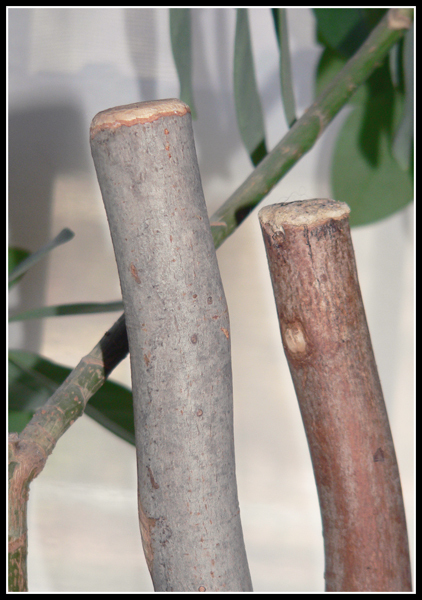 Propped against the trail sign were two more hiking sticks, hand-sanded and perfectly proportioned. Now, its not uncommon for people to leave sticks found along the trail, but someone had obviously put a lot of time and effort into these. They weren't poly'ed or carved, but they were sanded and rounded with the utmost care. But their presence gave us something to talk about for a bit. But, just as that bit had arose, it quickly left. It didn't take long for us to forget that mystery in favor of another (remember the ice sounds?). Halfway up the trail, though, we were greeted with a reminder. I immediately began to think, "Boy Scouts," but have yet to prove the sticks' origin. We found two more at our exit point, and decided to take these as we took the road back to the car. I decided it would be pretty fun to take them to the next trail we visited and leave them there, maybe even attaching a "Traveling Walking Stick" tag to them suggesting that the next bearer do the same. A week later and the sticks are still standing in the corner -- tagless, trail-less, tramp-less. It's not because I haven't had time, but rather the more practical version of me reminded myself, "Hey, Self! Remember that article you just read the other day?" Yeah... The one where people who left their names and/or contact information in summit logs found in national parks (some having been there for quite some time) were being warned of their "federal offense." Apparently leaving something behind in a national park is a federal offense - even if that something is just your contact info in an already present summit log. Now I'm beginning to question whether our parks (state or national) would frown upon the idea of a couple of "Traveling Walking Sticks." We haven't made any solid decisions, and I'm leaning more towards leaving them tagless and hoping the next bearer will appreciate the craftsmanship enough not to just dump it in the woods. Either that or taking the Dremel tool to them. But, we'd love to hear your opinion.